Not a book just for him, but a new daddy-themed picture book to read with the kids. Some years, finding the perfect book is difficult. There are a lot of dad picture books that just don’t hit the mark. This year, however, finding the perfect book was a cinch. I went shopping. This book was the first to catch my eye. I flicked through it. I smiled. I chuckled. I awwwwwed. Just in case my intro wasn’t spoilery enough for you, here’s my verdict: Amazing Daddy is a WINNER! First, the stars of the book are panda bears. Who doesn’t love panda bears? We learn all about a daddy panda bear as his child lists all the lovable things about him. Second, the language is perfect. Some books are too cutesy-poo. Some aren’t cute enough. Amazing Daddy straddles the divide with ease. And it nails the language. It speaks toddler without speaking down, and includes some lovely turns of phrase, including ‘he smells of safe and warm’ and ‘the naughty person step’. 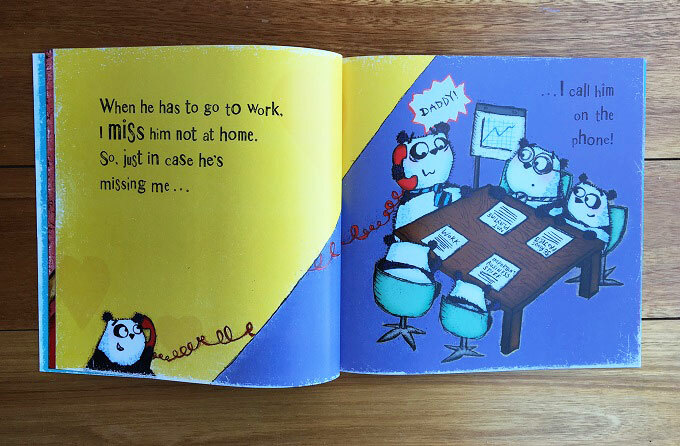 Third, it captures many of the things that our family does, both in the writing and in the illustrations. Just like the pandas, in our family it’s dad who bakes a big pile of pancakes most Sunday mornings. And it’s dad the kids call at work because ‘he’s probably missing us’. And it’s dad who is the chief carrier of tired little people. In fact, I should probably track down Rachel Bright. It sounds like she’s been spying on our family! 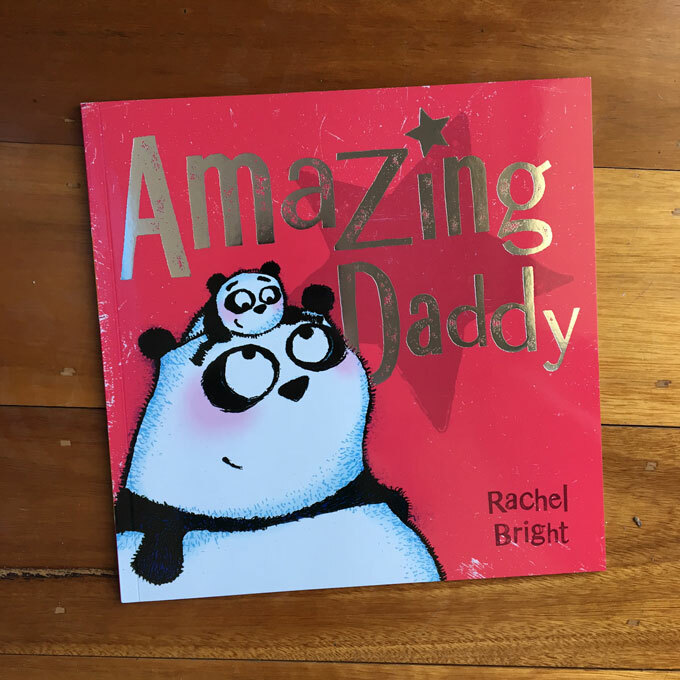 If you need another awwwwwdorable daddy-themed title in your children’s book collection, look no further than Amazing Daddy. Highly recommended for kids aged born and up, particularly those who have no filter when talking to, or about, their daddies. You can purchase Amazing Daddy from Booktopia here, or from Book Depository here. Have you read Amazing Daddy? What did you think? Oh that looks and sounds lovely! It’s adorable! It’s actually putting a lot of our other father-themed titles to shame. 2 weeks!! Eeeep! I thought it was a good month. Thank you for the reality check!! Daddy themed books are so gorgeous and really can only be given for a small window of time whilst the kidlets are small, so I’m all for them. I know, it’s sneaked up on me this year! Doesn’t help that it’s the week before ProBlogger. This sounds so cute! Love a good reading rhythm with just the right words. The right words are key. Ones that kids identify with, but not dumbed down. Because kids aren’t dumb. You write so beautifully and I can imagine that your letters to your husband might be romantic too. Ooh, what a lovely (if left-field) comment! I actually don’t write letters to him. Now I feel bad! Well, we all know my thoughts on panda bears… They’re basically heroes. BAHAHA! Perhaps Rachel Bright can make the next panda book about Hugzilla! That book looks adorable. The colours are cheerfully bright and happy. As for Pandas, adorable too. Yes, yes and yes. All killer, no filler. That looks like a great book. Nathan is also the pancake king on a Sunday morning in our family – maybe Rachel is spying on our family too???? Looks fantastic! I love the idea of giving a book for Father’s Day as part of the gift. The tshirts from your other post are so cute too! 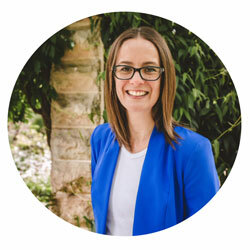 Don’t you find that as a blogger you always have to have your ‘special day’ posts out super early to give everyone else a chance to try your ideas?? It really is! Just the right amount of cute. You’re welcome! Father’s Day happens to be between some pretty big events for me this year, so I happen to be organised! I haven’t read this one yet (I don’t think! ), but it looks adorable! I love books as a gift to anyone! No worries! So glad to help.